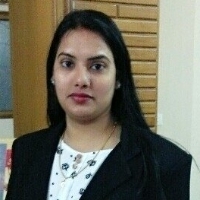 Dr Shuchi Upadhyay Tiwari has done her bachelors and masters in Nutrition from Bhopal. She then did a Ph D in Clinical Nutrition from Barkatullah University, Bhopal. She has worked at Ayushman Hospital & College as a Lecturer, at Hamidia Hospital as Dietician, at SHG College as Assistant Professor and at VLCC as a Slimming Manager. She joined Uttaranchal University in 2016 and has been working there as Assistant Professor & HOD Food Department. "After doing my bachelors and masters in Nutrition from Bhopal, I did a Ph D in Clinical Nutrition from Barkatullah University, Bhopal. I have worked at Ayushman Hospital & College as a Lecturer, at Hamidia Hospital as Dietician, at SHG College as Assistant Professor and at VLCC as a Slimming Manager. I joined Uttaranchal University in 2016 and have been working there as Assistant Professor & HOD Food Department."